Once upon a time there was a little boy who never spoke. After taking him to many doctors, who performed many tests, his parents resigned themselves to the fact that he would remain silent for life. One day, while seated around the dinner table, the boy said "The soup's cold." His parents were stunned! His father exclaimed, "He can speak!" His mother burst into tears and cried out, "All these years and you've never said a word! Why?" The boy replied, "Up to now, everything's been OK."
I love fan film productions. Batman, Star Wars, you name it... but mostly, I love Star Trek fan films. 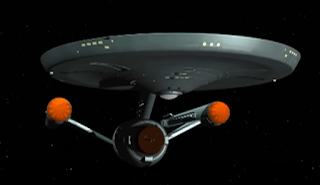 If I know about it, I watch it, from the relatively high budget professional fan movies like Renegades and Of Gods and Men to low budget made-with-love series like Hidden Frontier, to the high quality amateur fan series like Star Trek Phase II and Star Trek Continues, to the genuine surprise gems like Aurora. I love them all. I will overlook almost every wart and blemish you throw at me. Bad acting? Corny dialog? Visibly noticeable green-screen? Bad modeling and cheesy effects? Cardboard sets? Props made from taped-up flashlights? So what! The film-makers are amateurs, and are doing this because they love it, often at great expense to themselves, and without any hope of reward. Mostly, I love them because these people "get" Trek, in a way that the professional television and movie producers often do not. But finally, after hundreds of episodes from more than two-dozen producers, there's one I just can't deal with. I dislike it so much I'm compelled to state why, just so I know that my reasons are valid. So if you don't like negative reviews and blunt criticism, read no further. Also, if you don't like spoilers, read no further, because I'm going to necessarily spoil the entire thing, right down to the ending. UPDATE: Before you read further I'd like you to know that George Kayaian has responded in the comments. My comments are very blunt, and he has taken it in a far more professional manner than many professionals would have. This is a credit to George as an artist. I have nothing but respect. So after reading my rant, please read the comments for the film maker's point of view. There are plenty of production glitches here that I'd normally ignore, a great many of which could have been fixed in editing, but I want to focus on the story. And pardon me if I don't mention who plays which supporting character, as Kayaian neglected to include that information in the credits (with the exceptions of Gavin Scotti as Northon and Vincenza Montes as Admiral Hill). I'm not even sure of the spelling of the character names themselves, so I'll just refer to them by job title where there's doubt. The U.S.S. Antyllus, under the command of Captain Holt Allen (Kayaian) dispatched to deal with a hostage situation on a StarFleet base orbiting some obscure planet. When they arrive, they discover that the attack was masterminded by an old friend of Allen's, Northon (Scotti). Northon presents himself as the stereotypical evil genius with all the cards, and promises the release of all but four of the thirty-four hostages (the entire base complement) in exchange for a private meeting with Allen (no uniforms, no weapons). With no further discussion, Allen agrees and Northon departs, leaving behind what is quickly revealed to be thirty dead people. Allen nevertheless sticks to the letter of the agreement and rather than chasing down Northon's ship, he meets Northon at the appointed place sans weapons to negotiate for the remaining four hostages, who are, predictably, dead. Of course, Northon brought a weapon, but tosses it aside so they can go mano a mano. Allen and Northon tussle, Northon makes reference to past wrongs and laments that Allen's fiance didn't choose him instead, and confesses to murdering her. Allen retrieves Northon's flashlight phaser, stuns him, monologues a bit about how he has been left with no choice, and injects Northon with an exotic drug that will leave him a vegetable for life, saying "I hope you live a very long time." Allen then returns to the ship to claim that this was a botched suicide attempt on Northon's part and goes on about his business despite some very mild skepticism on the part of his Vulcan first officer. Holt Allen is a miserable negotiator. The first thing you do in a hostage crisis is determine whether there are hostages. Let's face it, if you're a villain, the purpose of taking hostages is to guarantee your own safety. So it's in your best interest to keep them safe; otherwise the authorities will rain Hell down upon you. Allen, as negotiator, needed to see whether he had to tread lightly or could simply march in and put the cuffs on a maniac. As it turns out, if he'd bothered to ask for proof he could have resolved this encounter in five minutes. Rather than holding all the cards, Northon didn't even have a pair of deuces. But Captain Allen never once even thought to ask. Nor did any of his crew suggest it. Likewise, Northon is a miserable villain. He threw away his only advantage long before Captain Allen arrived, leaving him with only one very questionable asset: a smug expression. Any claims of Northon's vaunted intelligence fade away when you realize how incredibly stupid that was. The only thing that saved his skin was that Allen was even dumber. Of course, once away, Northon should have kept going. Nevertheless, we can excuse his irregularities because he's batshit crazy. Allen brought a medical bag to their private encounter. Within that bag is a drug whose only purpose is to irrevocably leave a human being in a conscious state while shutting down all voluntary motor actions. This is a horrendous chemical weapon that has no purpose being in any standard medkit... the scientific equivalent of an unforgivable curse. And Holt Allen brought it with him, premeditatively. He intended to use it. Get that? He brought it before he learned of his wife's murder... before he learned of the remaining hostages' deaths. Certainly, he knew of the deaths of the station's crew, but that's all he knew, and all of those people were killed by a single act. Starfleet protocol would have him capture the obviously insane perpetrator and deliver him to a facility such as Elba II where he could have been treated. There are absolutely no exceptions for this. Garth of Izar attempted genocide, and yet was treated and cured on Elba II. Here, Northon was stunned... captured... helpless. He could have been effortlessly bound and returned to the ship. Instead, Allen chose to be psychiatrist, judge, jury, and executioner. There's no way that Allen should get away with this. The fact that Northon was incapacitated by a horrendous chemical weapon could not have been missed by the doctor as soon as the patient was beamed to the ship. Allen's story that it was a botched suicide attempt holds no water, and no Vulcan would be as credulous as Allen's first officer. The drug Allen used has no place in a medkit; which means he had to have taken it from the ship's medical stores. A simple inventory of the supplies would reveal that the same drug that was stolen was that which was racing around in Northon's bloodstream. Once the suspicion was sown, a mind meld with Northon's conscious, trapped mind could have revealed the true account. This would likely be attempted by a Vulcan or other telepathic doctor even if Northon were delivered to a Starfleet medical facility. They know the effects of this drug. They know that Northon is conscious. Starfleet requires their officers to undergo regular psychological evaluations, and Allen's irregularities would be caught there as well. THERE IS NO WAY that Allen would get away with this on any Starfleet vessel with even a moderately competent crew. Again, this is THE worst captain in Starfleet. Garth's mind was damaged in a horrible accident; Ronald Tracey was a good man gone bad; but Holt Allen is a bad man. He's a premeditated, cold criminal who should be stripped of rank and locked away. And yet, he's "OK" with his actions. And his crew are either incompetent, blind, or complicit. This episode is a clean break with the principles of the Star Trek franchise. It is so un-Star Trek that the production faults that I'd have normally overlooked come crashing down upon it. Long pauses in conversation as the actors search for their lines; conversations consisting of two people talking in opposite directions; dead air without ambient music; even the lack of proper credits. And as reluctant as I am to say this, ill-fitting costumes are re-interpreted in-canon as sloppy officers in sloppy dress with sloppy discipline. I've struggled to interpret this in some way that's less negative than I've just portrayed, and it just doesn't wash. If episode nine of Antyllus isn't a court-martial with conviction, then there's something rotten in Kayaian's alternate universe. I'd say sorry, George, but you wrote it. Don't blame me. On reflection, I'm going to add this footnote. There is, perhaps, some value to recognizing that not everyone in the future is perfect. But that value is rooted in the recognition of those imperfections. Whatever this show is depicting, it's far from Starfleet's finest hour. Thanks for the feedback, George. I appreciate all your efforts, and I appreciate the fact that you recognize you can't please everybody all the time. I just didn't have a taste for this one. Oh, I agree. And reflecting on those examples, you might agree that there have generally been pretty severe consequences for those characters whose ethics or judgement have lapsed. Commodore Decker died (or was shunted through Time, if you believe James Cawley). Captain Tracey wound up dead. Admiral Dougherty was killed by Ru'afo in Insurrection. To get away with this one cleanly, I think Holt would need a LOT of friends looking the other way. And while it's true that in your universe you call the shots, I still have the conviction that Starfleet Medical will surprise the Captain. I sincerely hope you do follow this up at some point with an even pithier show exploring the consequences of what Holt Allen has done here. I think we both see the possibilities for depth and drama. I promise there is a follow-up to this story line in the works! I decided long ago to make my series one long dramatic story, even though there are stand alone episodes along the way. Thanks Dave! I have noticed the series seemed to have a long running plot so I suppose that's how I viewed the episode and figure that more will be explained in future if I don't really get something. Christine from Facebook. Dave, I agree with you in the sense that this story could have been a little more developed. This was not my favorite episode of the series (to this point). However, it is a continuation of a series that has a lot of promise and some good story telling. It always gives a nod to the original series, but is also creates its own identity. I believe your critique / criticism of this particular episode is unduly harsh. As I said, you make some good points, but you missed the mark when you said this is so un-Star Trek. Thanks for your candor. I would ask that you watch some of the other episodes (Ep. 7 is exceptionaly good, and one of my faves) and I think you'll see that George does a great job. That doesn't mean I don't like George or his work. Quite the contrary! As I mention at the top of the review, these productions are done at great personal expense, and without any hope of monetary reward. I have nothing but respect for the work and for the love that goes into it. But THIS episode wasn't for me. Let me begin by apologizing for my bluntness….but….this may very well be the worst review that I’ve ever read. Mr. Leigh is clearly a very good writer and may have some critical abilities, but he knows nothing about the spirit animating Star Trek or the reason why people like George Kayaian spend their energy and resources to create fan films. I saw the episode, and, from my perspective, it was a thoughtful morality-piece in which a good person is forced to consider committing a questionable act for the greater good. This is exactly the kind of episode that Gene Roddenberry would have loved, because it forces you to THINK and doesn’t allow for simplistic moral answers. If Mr. Leigh had taken the time at all to watch the episode in an unbiased way, he would have seen that the captain is constantly struggling at every turn to do the right thing. The episode makes it clear that the captain does what he does, not out of a desire for revenge, but because he feels that he has no choice. It is the ultimate tragic situation. And that’s Star Trek at its best. This isn’t a multi-million dollar Paramount film. It is an act of passion created by someone who clearly loves the Star Trek universe and the ethos that animates it. If you want to attack something that violates everything that Star Trek stands for, attack the miserable reboots done by that schlock-master, J.J. Abrams. These films are truly worthy of condemnation, because they have no heart and no morality at all to them. But perhaps Mr. Leigh simply lacks the depth to appreciate anything that isn’t completely slick and superficial. If that’s the case, then I have some advice for him: stop reviewing Star Trek fan films and series because you just don’t get what they are all about. Since you obviously didn't pay attention to anything above the spoiler alert, I'm unimpressed with your opinion of the biases your imagination has assigned to me. Hey Dave-- this is George Kayaian. The resolution to this episode has just been posted (Episode 10 Parts 1 and 2) on Youtube under Starship Antyllus. Love to know your thoughts if you get the chance to check it out! Regards and hope all is well! Thanks, George! I'll check it out! Squidlings of the World, UNITE!